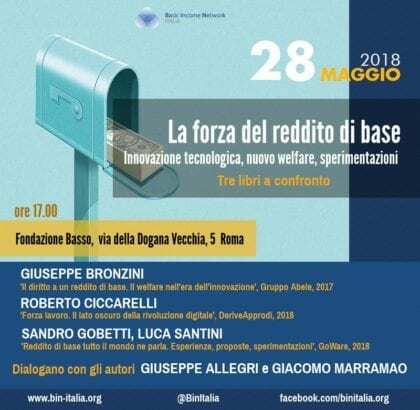 On the the 28th of May, at 17h, Fondazione Basso hosts in via della Dogana Vecchia 5, in Rome, a book presentation and discussion titled “The strength of the basic income. Technological innovation, new welfare and experiments all around the world“. The event will be an opportunity to compare and discuss different analysis and approaches on issues regarding the basic income proposal, as described in three different recently published books. Giuseppe Allegri (University of La Sapienza) and Giacomo Marramao (University Roma Tre) will also talk at the event. The meeting is organized by the Basic Income Network Italia.